On Friday, Aug. 5, eight Tusculum College students from the Bonner Leader Program partnered with the Middle Nolichucky Watershed Alliance to complete their first service project of the academic year. Individuals participated in a stream clean-up of College Creek, which is listed as an impaired stream on EPA’s 303d list. Students picked up one large trash bag of litter and helped to improve channel flow by clearing an area where twigs and debris were collecting around a tree fall. The main non-point source pollution issues facing the creek are agricultural runoff and sedimentation. College Creek is just one of 58 impaired streams here in Greene County. Keeping local streams clean helps to improve wildlife habitat and improves the quality of water flowing into the Nolichucky River, which is used recreationally and as a source of drinking water for Greene and Washington County. MNWA’s Adopt-a-Stream program is supported by a TVA Community Clean-up Grant, which helps MNWA to fulfill its vision to restore and protect the waters of Greene County and educate the public in ways to improve water quality. If you would like to schedule a stream clean-up, please contact Samuel Van Amberg at samuelvanamberg@yahoo.com. 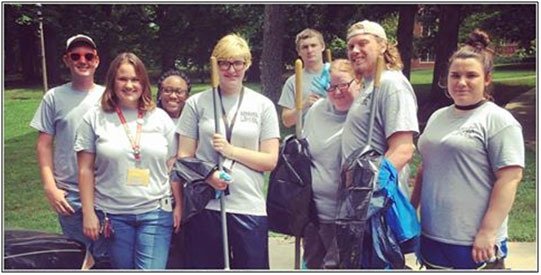 Tusculum College Bonner Leaders complete first service project of the academic year.